We moved into this lovely new condo several months ago, and as we get settled in I find myself trying out different work spaces for when I work on my beading. I have found a set of bead organizers that I absolutely LOVE and I am slowly moving all my beads over to this new system. Sadly, this system is a bit more expensive than I would like, which means I can’t move them all over all at once. Still, while slow, this process has me rethinking how I organize my beads. Mainly I work with seed beads, delicas and Swarovski crystals/pearls. Smaller beads that fit perfectly into the organizer’s tiny boxes. I haven’t even started on the larger beads I use for stringing. Though I have to figure out a better way to store my chains. They are one of the odd ball things I don’t have a really good way to store. I’m pondering using old spools to wind them on, but don’t actually have any old spools to try it out. So winding the chain on cardboard seems the next logical step. Hm. 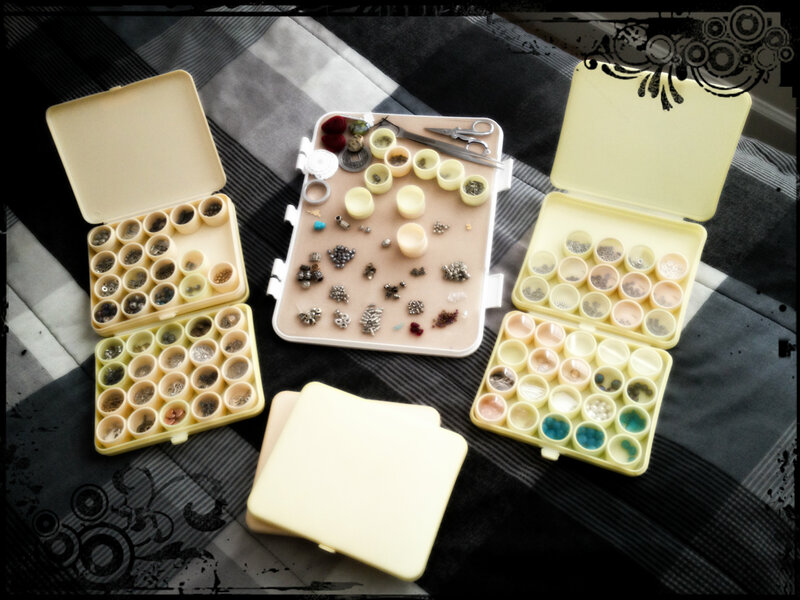 The organizer that works wonderfully with these smaller beads would be the ones from Bead Storage Solutions. I get mine from Fire Mountain Gems and have had no problems with them at all! They have several options with regards to size, so you can definitely work with the larger beads, but for my purposes I stick with the smallest and have been quite happy with that choice. They even come with their own little labels that you can affix to each container so you can keep track of color, size, price, whatever you need to keep track of. These are my only complaint as the glue they use doesn’t stick well to… anything really, so you are going to have to make sure it stays put. A minor inconvenience to be sure, but one you should be aware of. They even have a larger tray that holds all your tools and spools of thread and one that is supposed to hold your work in progress. I don’t use the last one because I have something else that works better for me, but as you can see, it’s a really great system. I am currently working through each of the trays, putting like beads with like, and then sorting them by color. This will take a while, but it will be really helpful when I am looking for that one specific bead that I need for a project. Another thing I am planning on doing with the seed beads and the delicas is creating a color rope that I can take with me when I go shopping so I don’t purchase the same color twice. (or if I need more of the same color I can match it to the new beads because sometimes the dye lots just don’t match up.) This will take some time, but will be totally worth it in the long run. Buying duplicates is always frustrating and while I will ultimately use the beads, it is rather wasteful. I am going to use Herringbone I think, it works up fast and makes a wonderfully flexible rope I can keep with me pretty much at all times. Granted, I will have to see how long the sucker gets, but I’m certain I won’t mind keeping it on me even if it is a little longer than I expect. It’s beads, not much can go wrong with that. It’s a project I’m looking forward to for the mindless enjoyment as well as the organizing aspects. How do you keep your beads organized? I’d love to see it!